So RB Len Wyda against King's. The Warrior running backs have persevered through injuries to show off one of the most eclectic and deep groups of running backs in the MAC. 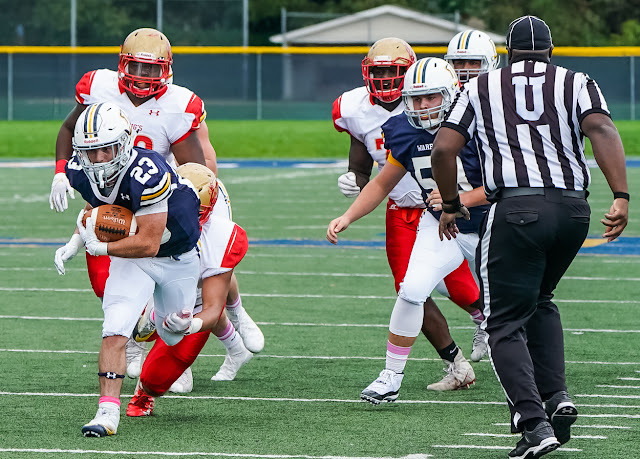 Three different Warriors - juniors Jacob Fimbres and Keith Batkowskiand sophomore Len Wyda - have run for at least 80 yards in a game, marking the first time since 2015 that the team accomplished that feat and the first time three Lycoming running backs have done that this century. Fimbres, a transfer from Pasadena City College, got the ball 23 times, rolling up 117 yards against Widener before notching 92 against Lebanon Valley. Batkowski, an all-state selection at Montoursville Area High School, racked up 101 yards and a touchdown in 28 carries at Widener before posting 80 against Lebanon Valley. Forced into service due to injury, Wyda has started the past two games, rolling up 88 yards against FDU-Florham. In addition to those three, both freshmen Chase Cramer and Justin Joseph have run for at least 40 yards in a game this season. 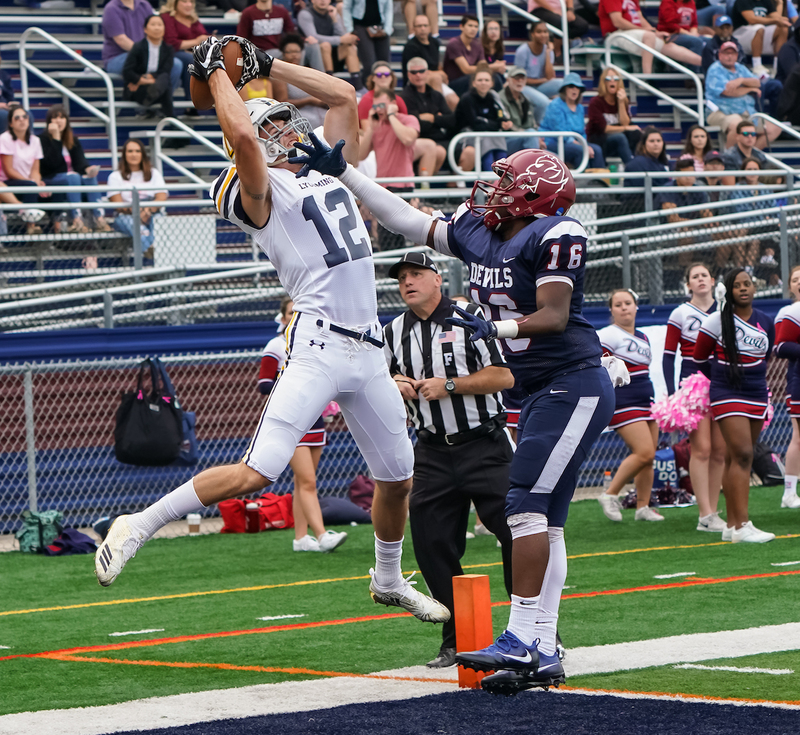 Sr WR Nick Costello pulls down the ball for another touchdown against FDU-Florham. Sixth in school history with 1,896 receiving yards and 121 receptions, senior Nick Costello has moved into the top five in program history with 20 career touchdown receptions, sitting just one shy of being in a tie with former teammate Ryan Umpleby (2012-15) for fourth in program history. Costello is just 104 yards from becoming the sixth receiver in program history to post 2,000 receiving yards in a career, while he is four receptions shy of becoming the sixth to post 125 in a career. 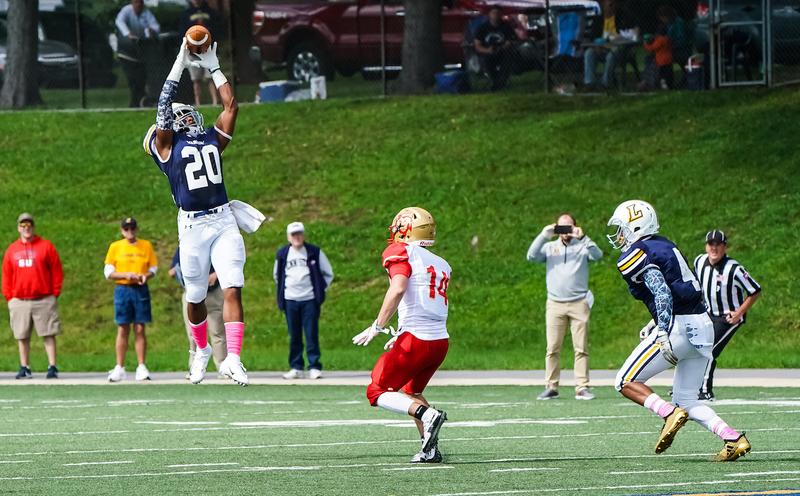 Jr DB Jeff Coplin makes interception against King's. A converted quarterback, junior Jeff Coplin has found a home in the Lycoming secondary, where he has started all five games as a safety, posting 13 tackles through the first five games, including a career-high five against FDU-Florham. It's been his impact on other team's passing games that has been noticable, though, as he has an interception in each of the team's last three games, which leaves him tied for second in the MAC in the category. He is the first Warrior with interceptions in three straight games since Ray Bierbach '12 did it during the 2010 season. Sophomore twin brother linebackers Mike and Matt Kalyan have both risen to the top of the depth chart of Lycoming linebackers and will make their first starts alongside each other on Saturday at Delaware Valley. A transfer from Mount Union, Mike is third on the team with 22 tackles and he leads the team with 4.5 tackles for loss. He also has posted an interception and a forced fumble. Matt, who struggled with an injury as a freshman, has added nine tackles, two for a loss, from the middle linebacker position and he also forced a fumble. Both players were all-state selections as seniors at Schuylkill Haven in 2016. They are Lycoming's first set of brothers playing together since Ethan and Jarrett Jeffries in 2015 and the first set of twins since Luke and Andrew McGreevy in 2011.